Both the men’s and women’s swim teams finished in tenth place at the NCAA DIII Championships in Indianapolis, which took place March 19–22. The men scored a total of 146 points while the women put up 122 points, and both achieved a remarkable number of All-American awards. Kenyon College won the men’s division with a total of 480 points, and the winner on the women’s side was Emory University with 595.5. Prior to this season, the South Siders’ best NCAA performance was a 28th-place finish for the men and a 21st-place for women. Also noteworthy was the record number of Maroons who qualified for Nationals—22 swimmers and divers—considerably larger than ever before. While the 10th-place titles were impressive for the teams, first-year Abby Erdmann unquestionably deserves the most outstanding accomplishment of the weekend. Erdmann swam a lifetime best by more than 2.5 seconds in the 200-yard butterfly and finished first overall, claiming a national title. She is only one of fifteen individuals in Maroon sports history to win a national championship, and the first title from the pool since 1989. First-years Alison Wall, Jonas Fowler, and Cara LoPiano, and fourth-year Eric Hallman all improved their times in at least one event. In addition, third-year divers Matt Staab and Tony Restaino both placed in the top eight in the 3-meter dive. In preparation for the championship meet, the athletes trained just as they would for any competition. For many of the athletes, the mental preparation presented more of a challenge since they were left with a month to prepare after their regular season. It was crucial they maintained full focus and enthusiasm for the period prior to NCAAs. 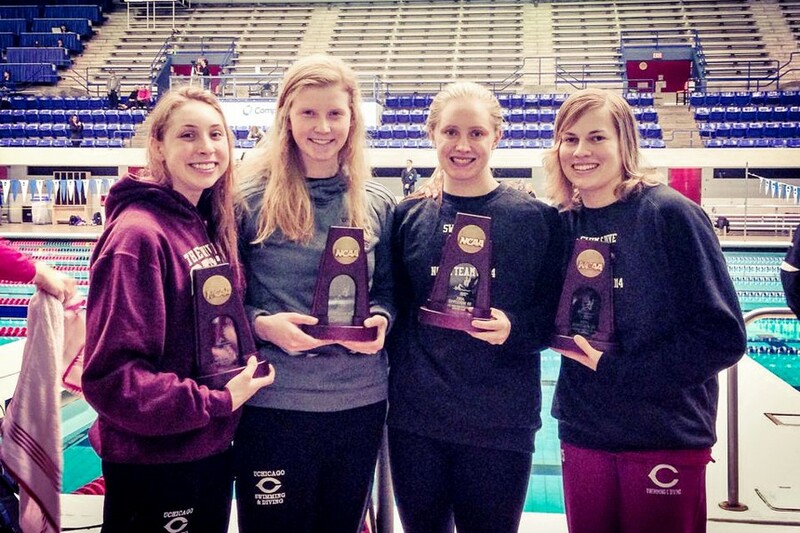 In total, the year ended with UChicago achieving a record-shattering 53 All-American honors, which is why each NCAA-qualified athlete had high expectations for Nationals. “This year we had a large number of returning swimmers who fully expected to qualify and were looking to score instead. That change in attitude makes a huge difference,” Hallman said. Hallman, the only fourth-year to qualify for NCAAs, acknowledged the immense effort the team will have to put forth to place higher next season. Still, the potential of the young team inspires confidence in him since he believes the team can realize this goal after his graduation. The men’s team may be one of the best DIII teams in the nation next year. In the words of Sir Winston Churchill, “Now this is not the end. It is not even the beginning of the end. But it is, perhaps, the end of the beginning.” Though they have reached the end of this year’s competition, their sights for next season are set high.